It’s Kentucky Derby time and the Run for the Roses is about to begin! If you aren’t able to cross off actually attending the most prestigious sporting event in the world, Shonal’s Kitchen can help you plan a fabulous home party. It may be the most exciting 2 minutes in sports, but let’s make this house party a day full of good food and good friends, that’s sure to be remembered. While traditionally, the Mint Julep is the most popular drink served at the Derby, we’re changing it up and making Spicy Bloody Mary’s! 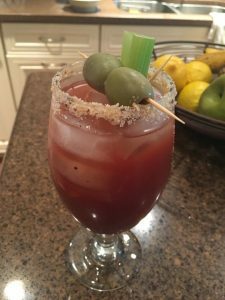 You can’t go wrong with a Bloody Mary and it’s always fun to dress it up with your favorite garnish! This recipe is for ONE drink, so you’re going to want to make a lot of these! The Bourbon Bacon Salted rim makes every sip more and more amazing. Dip the rim of a tall glass in water and then in SplenDishes Bourbon Bacon Salt, then fill with ice. In a shaker, combine all ingredients (except garnish). Shake well and pour into salt rimmed glass. Garnish with celery stalks and olives. Let’s get rocking with some food. 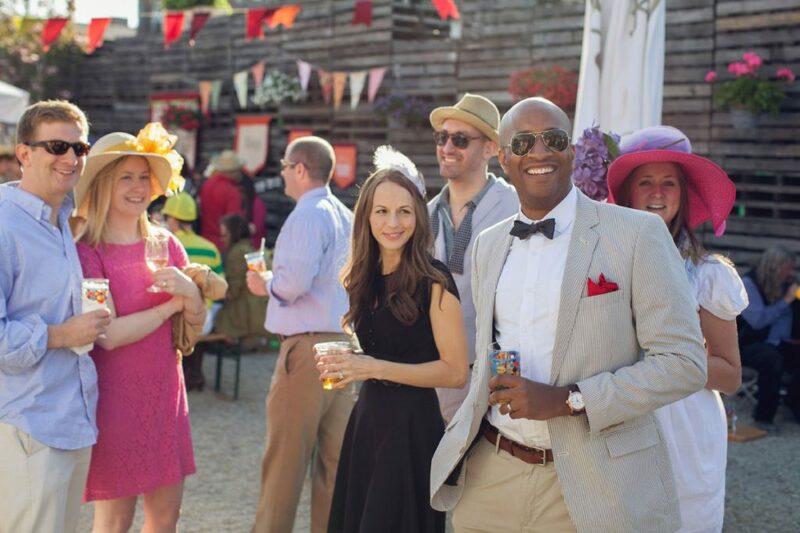 To create the full Kentucky Derby Experience, traditional Southern fare is a must! 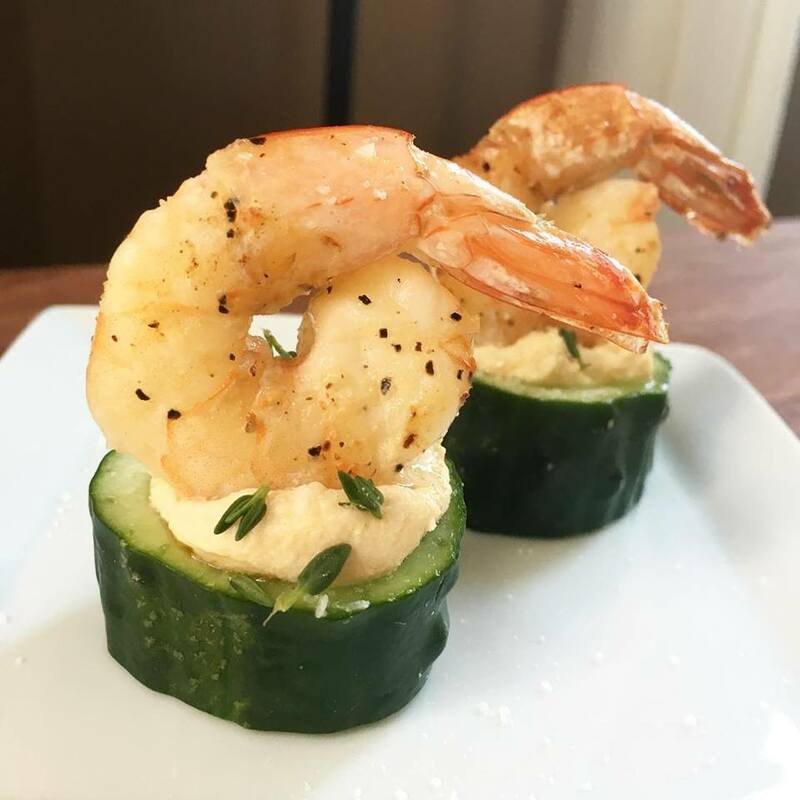 Of course I have to put the SplenDishes spin on pretty much everything I make, and these Pickled Shrimp with House Made Hummus served in Cucumber Cups are pretty fancy. 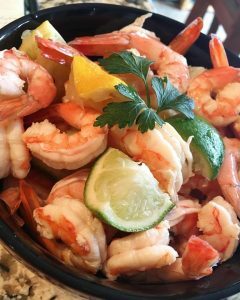 Make an extra batch of the Pickled Shrimp and serve them in a bowl with lemon and lime wedges. Your guests will love noshing on these addictive little bites of heaven. If you’re not up to going all the way out and making your own hummus, store bought hummus is more than ok! Poach shrimp in 2 cups water plus 1 cup white wine until opaque and cooked through, about 4 minutes. Transfer to colander and run under cold water to stop cooking. Combine remaining ingredients in a large bowl, then add shrimp. Cover and marinate for 4 hours or overnight. Combine ingredients in food processor and blend until creamy. Season to taste. Keep in sealed container in refrigerator for up to 2 weeks. To assemble: Drain shrimp and place on paper towels to absorb excess liquid. 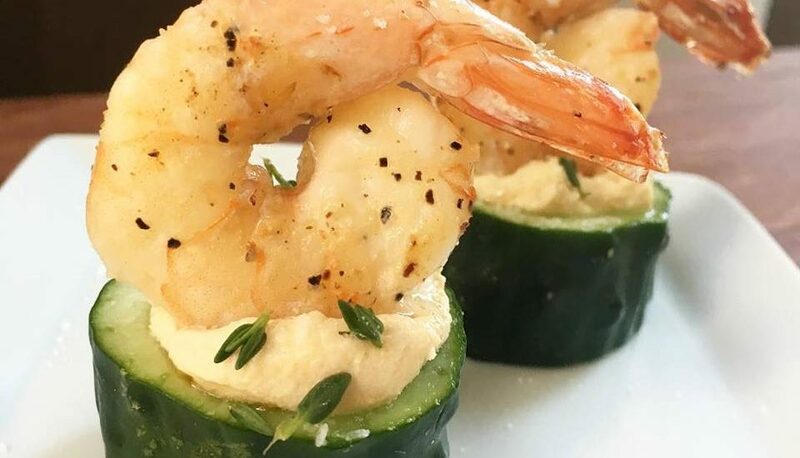 Place hummus into pastry bag and pipe into each cucumber cup. Sprinkle a pinch of Rosemary Lemon Salt over each and place a shrimp over hummus. Garnish each with a small sprig of fresh dill. Time for something hot with oozing cheese (I never fail with this!). The Kentucky Hot Brown recipe originally came from the Brown Hotel in Kentucky in the 1920’s. 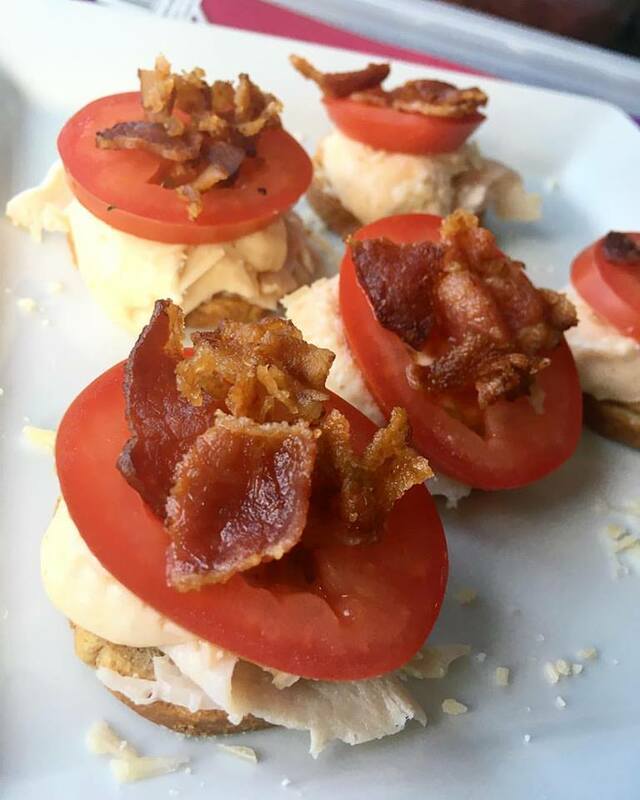 A pillowy cushion of toasted bread, topped with sliced turkey, and an avalanche of cheese sauce broiled to a golden brown, then topped with crispy bacon and tomato. Seriously. Can this sandwich get any better? I’m going to try….while the traditional sandwich has to be eaten with a fork and knife (unless you’re a savage, and that’s ok, but not so proper or Derby-like), I’ve decided to make bite size Hot Browns. They’re still happy and cheesy and full of crispy bacon goodness, you’re able to eat them with your hands and be civil while doing it. Pumpernickel or rye bread toasts are great to use, I couldn’t find them (I probably didn’t look hard enough), so I decided to use Melba toast. It holds up to all that cheese sauce goodness, that makes you think, “Is this what heaven is?”…. Melt butter in a saucepan over low heat; add flour, and cook, whisking constantly, until smooth. Whisk in milk over medium heat, whisking constantly, until mixture is thickened, then add Cheddar cheese, whisking until cheese melts. Season with House Blend and red pepper flakes. Top bread with sliced turkey. Spread cheese mixture over turkey. Sprinkle with Parmesan cheese and half the bacon. Broil at 500° for 2 minutes or until Parmesan is melted. Top with tomato slices, and sprinkle evenly with remaining bacon. Combine honey and bourbon together in a small sauce pan over low heat. Simmer until honey is dissolved. Cool and stir in lemon juice. Combine with strawberries and keep chilled. In a mixing bowl, combine bisquick, sugar and milk until roughly mixed. Using an ice cream scoop, spoon onto parchment paper lined baking sheet and slightly flatten. Brush with melted butter and bake for 10-12 minutes until golden brown. 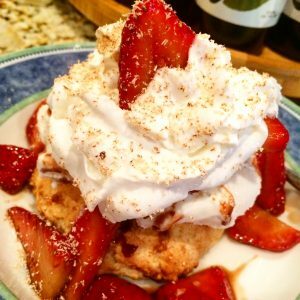 To serve, place shortcakes in bowls, top with ice cream, whip cream and spoon strawberries over top. Grate fresh nutmeg over top. By now, your guests are fat, happy, tipsy and possibly a little richer. Good job. Let’s talk about how to make your pad, Derby worthy. Whether or not you’re going totally formal, keeping it casual or a little in between, here are a few tid bits on how to decorate your place with some Derby spirit. Set up special drink stations where guests can make mint juleps, using different flavored simple syrups. Well my sports loving friends, may the best horse win and be off to The Preakness! Cheers, until our next sporting event!